Charlotte Lightwood has one season to find a husband or she’ll be forced to marry her guardian’s loathsome cousin. With no title or dowry, she doesn’t have much hope of making a good match. Sebastian Wilkinson, the Earl of Marley, has been the most eligible bachelor on the marriage mart for more years than he cares to count and is very aware of his duty to marry a woman who will add to the wealth and stature of his title. Sebastian makes Charlotte an offer she can’t refuse: he will pretend to court her to help her attract more suitors in exchange for her advice about which ladies he should pursue. As they work together, their mutual attraction grows. When they realize they just might be perfect for one another, they must decide whether to bow to the dictates of society or follow their hearts. Ally Broadfield brings all the fabulous elements of a traditional Regency and adds just the right amount of spice with this historical novella. 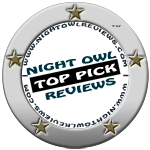 I highly recommend this story if you are a fan of the traditional Regency romance yet enjoy a little added heat. 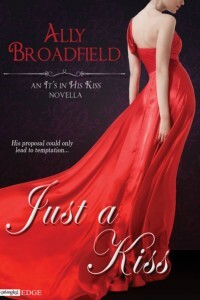 Just a Kiss by Ally Broadfield was an entertaining, beautiful read with so many shocking, laughable and romantic moments! Sebastian’s character is completely dreamy and Charlotte’s character is absolutely beautifully written that you cannot help but be caught up in their story! A cast of characters – some absolutely charming, some wicked and some just downright dreadful makes Just A Kiss one sure fire entertaining read that will captivate you and doesn’t disappoint. A terrific start to the It’s In His Kiss series. 5 Charming Stars! Broadfield gives her readers a complete, and amazingly sweet, story in just about 100 pages. Just a Kiss is the perfect choice for readers who are looking for a quick read on a beautiful spring day. It may go fast but you’ll devour every page and finish with a little happy sigh. Captain Mikhail Abromovich would rather single-handedly face the entire French army than follow orders to deceive Anna, the woman of his heart, by feigning a courtship to hide his covert activities. Ever since a gossip sheet revealed the details of her extensive dowry, Princess Anna Tarasova has been overrun by fortune-hunting lords. When her childhood sweetheart mysteriously appears in London and asks to court her, it seems too good to be true. For Mikhail, who is both soldier and spy, being chosen to represent Russia in secret negotiations with Britain should be the assignment of a lifetime. But once his deception is revealed, he’s certain Anna won’t believe his love is real. Anna overwhelmed him with her smile. His words stuck in his throat. If possible, she was even more beautiful than she had been the last time he saw her. She was slightly taller and had filled out a little, lengthening here and rounding there, as near to perfection as any woman could be. She shifted her gaze to something else, then met his eyes. “Should I expect you this afternoon, then? Natalya will be thrilled to see you.” Her eyes roamed over him, and a wave of heat engulfed him before she turned away to collect her sword. She held the sword in front of her in an unconsciously protective gesture. He ought to have known she was too perceptive not to have noted there was something odd about his sudden appearance. Her words sent an arrow through his heart. “I haven’t forgotten,” he whispered.